Home / Hot Deals / Time to let the HERO Out!! New Super Hero Costumes! Time to let the HERO Out!! New Super Hero Costumes! It is Superhero Savings week at BuyCostumes.com, where the family that fights together, saves together! 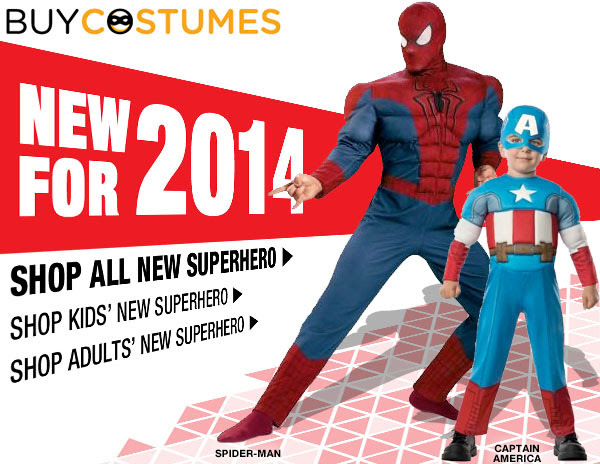 You’ll find an incredible variety of superhero costumes for everyone in the family (even the dog) at BuyCostumes. Trick-or-treating and Halloween parties will be taken to the next level when your entire family shows up dressed as crime fighting superheros. Just pick the super crew that most clearly resembles your family and have some fun! Be sure to save on that super suit! Get 15% off orders over $75 at BuyCostumes with coupon code AFCBC1575and outfit the entire family! We just love the Batman family – check them out below! Who’s your favorite superhero this year?